More than 50,000 students will take aim at 3-D archery in S.C. schools this year, adding new competition to adrenaline-filled arenas. The dynamics of school academics, sports and clubs are evolving every day to adapt to modern-day challenges and changes, but for most young folks the yearning to head outdoors and outside the classroom walls remains a constant. 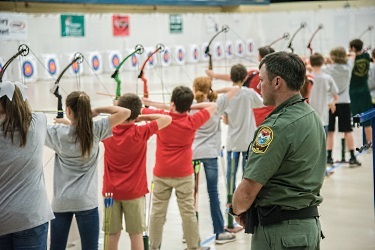 Hundreds of South Carolina schools are discovering a way to help students rekindle that outdoor connection with the added benefit of improved focus - through the National Archery in the Schools Program (NASP). When she's not on duty, South Carolina's NASP Coordinator, SCDNR Staff Sergeant Charlotte Mayhugh McKee, is a tournament archer herself. She relates to the adrenaline rush and the motivation that goes with the sport. And she also knows firsthand how the Archery in the Schools program is changing lives. "The SCDNR is invested in seeing students get excited about the outdoors," McKee said. "NASP is a great way to introduce youth to archery and to the outdoors, and the program is unique because it is part of the school curriculum and taught during the school day." She said that last year more than 50,000 fourth through twelfth grade students from 410 schools participated in South Carolina NASP. And in 47 states across the country, 2,437,128 student archers representing 14,442 schools participated in NASP. The numbers speak volumes. McKee is enthusiastic about additions to South Carolina's archery tournaments this year. "We are focusing on the expansion of International Bowhunting Organization (IBO) 3-D here in South Carolina. This archery season, there will be two tournaments in one, with the inclusion of an IBO 3-D competition at every level." The archery competitions, now with IBO 3-D events, are geared to spark an interest in hunting and introduce students to other SCDNR programs like TOMO, she added. There will be three regional competitions in South Carolina, with top scorers going to the state archery tournaments, including competitions in Myrtle Beach, Anderson and in Columbia at the S.C. State Fairgrounds. All of this leads up to a three-day statewide archery competition held in Sumter and national events. "We are excited to see the competition side of NASP in South Carolina grow," McKee said. "We gave away $34,000 in scholarships to high school seniors who participated in NASP in 2017 and look forward to that number growing in the future." 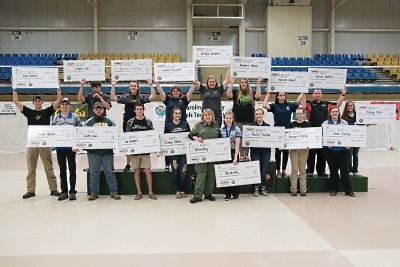 Nationally, NASP awarded $1.4 million in scholarships to senior archers. In order for archery to become a club or school sport, NASP must be taught first as part of the school's curriculum for a minimum of ten hours during the school day in a class setting, such as in a physical education class. McKee and other SCDNR instructors offer training and guidance to interested schools throughout the year. Anderson County physical education teacher Jeff Terry has coached and taught students all kinds of sports during his twenty-four years in education. Flashing back in time to 2006, archery was brand new to him. He shares how he was introduced to NASP, and today he coaches archery teams at LaFrance Elementary, Riverside Middle and Pendleton High. "I grew up playing every sport I could but was never exposed to many out-of-the-mainstream sports," Terry said. "I am an elementary P.E. teacher. After about ten years of teaching, I was looking to add something different and exciting to my classroom that met the state and national educational standards - and to develop micro and macro motor ability, listening and observation skills, and wasn't in the normal athletic spectrum." In 2006, Terry attended the South Carolina Alliance for Health, Physical Education, Recreation and Dance convention in Myrtle Beach, where he went to a session that explained the National Archery in the Schools Program. The SCDNR presented the program outline, the start-up costs and available grant funding to help purchase equipment. He recalls presentations from P.E. teachers and coaches from the state describing how NASP was patterned after International Style Target Archery, the benefits of the program and how they implement it into their classroom. "As I was sitting there with my brain and heart excited about this opportunity for my students, all I could think about was, 'How am I going to sell this to my school and district?'" Terry said. "When I got back to school the following week, I sat down with my school principal, Hope Bass, at LaFrance Elementary School and discussed the NASP program. She was on board from the beginning and with very little effort convinced our administration in Anderson School District Four to set up a training at LaFrance Elementary for all of our P.E. teachers in the district. In the fall of 2007, we received our training and started teaching the NASP program the following spring." After a couple of years teaching archery on campus, Coach Terry drove to Columbia to observe the S.C. NASP State Tournament. He was ready to get started, and his teams were ready to hit the road running. "In 2010, during our first year of existence, LaFrance Elementary won the state championship," he said. "This caused an unbelievable excitement throughout our school district, so now all of our schools have a NASP competition team." Terry has personally seen the positive impact of NASP at these schools - benefitting teachers and students alike. "Educators are looking for ways to improve student motivation, attention, behavior, attendance and focus - and teachers hope to engage each student in the educational process and develop relationships to promote graduation instead of drop-out. NASP improves skill sets, and students who participate often improve in other areas of their lives. This archery program helps to build community relations with parents, businesses and community leaders because they realize we are guiding our future by training these students with skills like responsibility, cooperation and trustworthiness." Introducing NASP to South Carolina is a passion for Staff Sgt. McKee and so many others like Coach Terry. The SCDNR has maintained a steady stream of support for participating and interested NASP schools. Tailored instruction, sponsorship and start-up grants are in place, and participating schools and sponsors continue to grow at a healthy rate. "We work very hard on securing grant money to make the program as accessible as possible to all schools - this includes public, private, charter and home schools," McKee said. "When a school is interested they take our Basic Archery Instructor class (BAI). We offer this class for free for up to two teachers per school. Schools with more than three hundred NASP eligible students can qualify for a grant for equipment. The grant on average is worth $3,000 and includes all the equipment needed to get started. Schools are then required to teach the NASP curriculum for a minimum of ten hours of in-school instruction each school year. After this they may form an archery team or after school archery club." The SCDNR strives to introduce the NASP program to all schools across the state. According to Terry, in his region this expansion is evident, and the support is strong. "After a few years of holding just a state tournament, and with the growth of South Carolina NASP teams, they [SCDNR] saw a need for regional tournaments," said Terry. Anderson School District Four has been fortunate enough to host a fourth regional tournament this year along with SCDNR at the Anderson Sports and Entertainment Center in February 2018. The NASP program has grown so much in the Upstate. 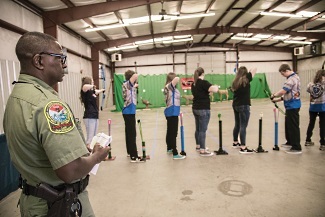 We hold our own bullseye and IBO 3-D tournaments at Pendleton High School, and we have always been supported by SCDNR officers attending our local tournaments." Archery in the Schools is helping South Carolina students succeed in countless ways, as summarized by Terry. "The NASP program produces young people with the capability to communicate, focus on a task, perform under pressure and work together as a team to accomplish a goal. These qualities will lead our South Carolina youth in a direction to make a positive impact in our communities, state, nation and world." For more information on South Carolina NASP, visit www.dnr.sc.gov/education/archery. Cindy Thompson is managing editor of South Carolina Wildlife. SCDNR's Archery Coordinator Charlotte McKee talks about the Archery in the Schools Program and demonstrates the 11 steps of Archery Success.